Craftsman-style homes continue to be among the most popular home styles in America, and the market for craftsman house plans to accommodate the demand is robust. Craftsman houses come in a variety of shapes and sizes, from modest bungalows to ‘American foursquares,’ each with its own unique architectural and design elements. Due to ever-increasing construction and utilities costs, coupled with increased consideration of environmental impact, many homeowners are particularly interested in craftsman house plans for narrow building lots. The craftsman house plan is rooted in the 19th century arts & crafts movement, which initiated in Great Britain before taking hold in the United States. The arts & crafts movement was largely a rejection of the mass-production ethos born from the Industrial Revolution and was an attempt to return to artisanal, hand-crafted goods–including homes. With their low-pitched roofs, overhanging eaves, large front porches with tapered pillars and extensive use of natural materials both inside and out, craftsman homes represented a break with the monolithic construction practices of the mid to late 19th century. This similar desire among homeowners in current times to own a home that isn’t a cookie-cutter version of every other home in the neighborhood has led to a renewed clamoring for craftsman house plans. As mentioned above, there is an especially strong demand these days for craftsman house plans for narrow lots. One reason is economic: It is typically cheaper to purchase a smaller, narrow lot than a larger piece of property. Also, homes built on narrow lots are usually smaller in total square footage, reducing the cost of building materials and future maintenance. Smaller homes also typically incur lower utility bills. Another financial benefit to craftsman homes is their high-quality construction, charming appearance and straightforward design means they generally hold their resale value when the time comes to sell. Some reasons for this are that craftsman house plans make good use of natural light, they have open floor plans that feel larger than they actually are and often have high ceilings, which furthers the feeling that the home is bigger than it is. Beyond the financial reasons to build a craftsman home, environmental reasons also loom large. Many people, especially millennial first-time homeowners, are attracted to city life and want to take advantage of urban infill building opportunities rather than moving to the suburbs. This helps reduce sprawl and also helps stabilize urban neighborhoods. Narrow-lot homes also typically suffer less heat loss, offering greater energy efficiency, and because the lots are smaller, less lawn maintenance needed. Because these style homes have been popular for decades, a craftsman house plan used to build a brand new home will look and feel right at home next to houses built generations ago. Craftsman-style homes have endured through multiple housing trends through the years because of their high quality, easy liveability, and timeless architectural style. As more Americans look to build new homes in urban areas, keeping both economic and environmental factors top of mind, there are numerous craftsman house plans designed for narrow lots available to choose from. With so many options to choose from and unique design elements to consider, there is sure to be an option that meets your family’s needs. Ranch house plans are consistently the most desired home type among American homeowners. After all, the ranch style home was invented in the United States, and with their low-pitch roof lines and attached garages, they have become a singularly identifiable part of the American landscape. Ranch house plans with walkout basements are especially popular, as they provide many features and benefits typically associated with multi-story homes while still containing the main living space to one floor. Many people desire to own a home that is stylish, easy to maintain, unobtrusive and affordable. Ranch house plans check all these boxes and then some. 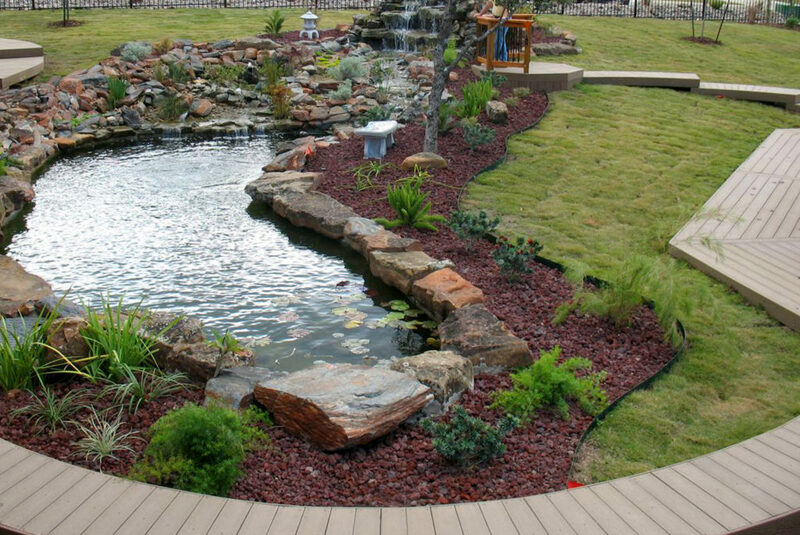 Ranch homes come in an almost endless variety of layouts, so there is sure to be a plan to suit every homeowner. Ranch homes can be built using many types of materials, suitable to the homeowner’s preferred aesthetic. Some exterior materials, such as vinyl siding, also reduce the amount of time and money needed for ongoing maintenance. One advantage that multi-story houses have over ranches is that they often provide more living space than ranches. However, ranch house plans that incorporate walkout basements can reduce or even eliminate this disparity. A walkout basement provides additional, functional living space by providing an additional entrance, generally on the back side of the home. There are several reasons to consider a walkout basement option with your ranch house plan. A walkout basement provides easier access to the backyard and opens up opportunities for outdoor living and entertaining space such as a patio, outdoor dining area, or a swimming pool. A ranch house plan with walkout basement naturally lends itself to adding a deck to the main living space, particularly when building on sloped lots, extending the outdoor usability of the home and often providing for spectacular views. A main-level deck also provides additional shade and shelter to the backyard area. A walkout basement provides additional living space, which can be used for adult children or an aging parent living in the home, giving them a separate entrance and a degree of added privacy. This space can also be used for a children’s play area, a recreation area or ‘man cave,’ a home theater–the options are endless. Ranch house plans with walkout basements make practical sense because they usually improve resale value of the home by providing more living space. With the foundation walls exposed on one or more sides, full-size windows can be used, which provide lots of natural light and makes the space warmer and more inviting. Ranch homes are the quintessential American home type and are likely to remain among the most popular of home styles for many years to come. Due of this tremendous popularity, each individual is certain to find the ranch house plan that best meets their living arrangement needs. Vacation house plans.One would think that the name says it all. However, this group of house plans presents great choices for a weekend getaway home as well as thoughtful options for rental property, in-law or guest cottages, or simplifying an empty nest. Additionally, vacation house plans come in a variety of shapes and architectural styles making them suitable for any terrain or landscape from waterfront to mountaintop to city street. Below are a few designs to get you thinking about what type of vacation home (or in-law cottage) is right for you. 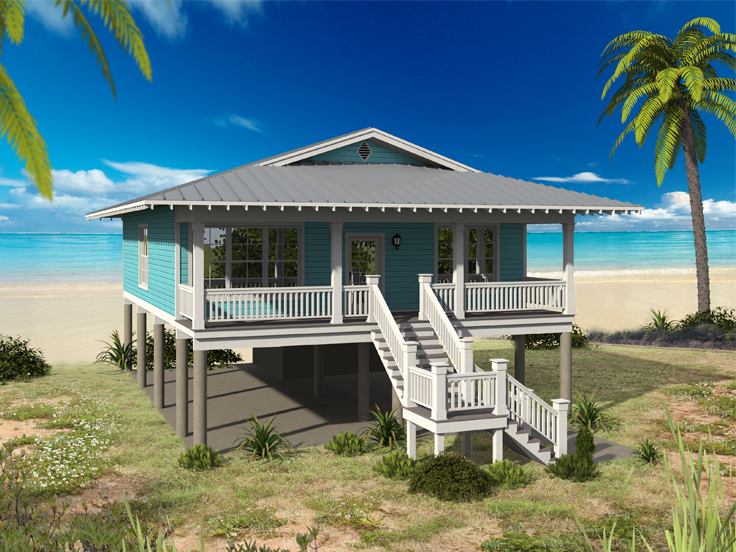 062H-0122: For the warm weather lovers, relax at the beach with this nifty beach house plan. There is a welcoming porch where you can sit and enjoy warm breezes, but the interior should not be neglected. A vaulted ceiling over the open living area creates a spaciousness feel. Storage space abounds. Two bedrooms provide walk-in closets. The kitchen has a pantry, while there is a closet for linens and another for coats or better yet flip-flops. Under the house is space for parking and a storage closet for beach balls, chairs and surf boards. 032H-0005: This rustic mountain getaway packs a wallop of usable interior space. The second floor includes two bedrooms plus lots of storage for managing all of life’s extras. On the main level, find another bedroom, a full bath, and the open living spaces. While meals are being prepared in the kitchen, the rest of the family can warm themselves in front of a cozy fireplace. Lots of windows, a deck and a second-floor balcony will deliver unforgettable views. So pack up the kids or invite your friends for a fun and exciting getaway. 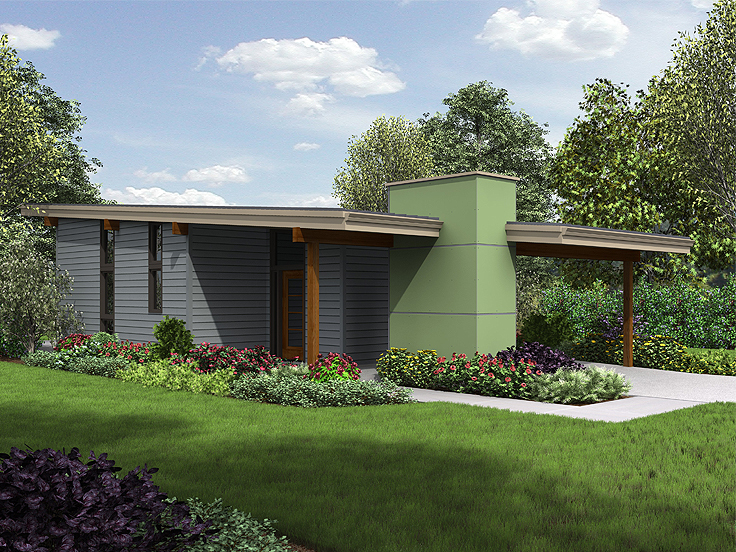 034H-0227: Here’s a modern-style vacation house plan for city living. It is suitable for weekend getaways in urban areas, but it’s compact design makes a nice option for an in-law suite as well. Notice the welcoming front porch and carport with storage closet. In back find a patio perfect for grilling, entertaining and relaxing. Inside, the open living space features vaulted ceilings, built-ins and a fireplace. Two bedrooms share a Jack and Jill bath and a laundry closet offers convenience. 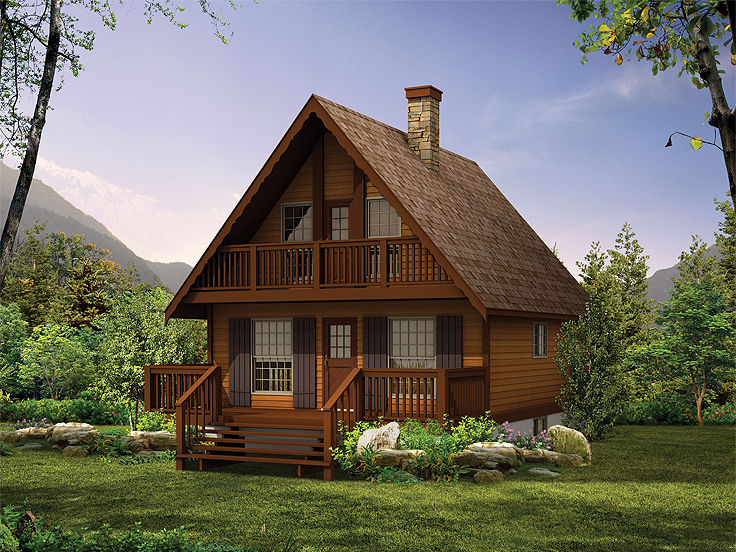 Please browse our entire collection of vacation house plans for more ideas. 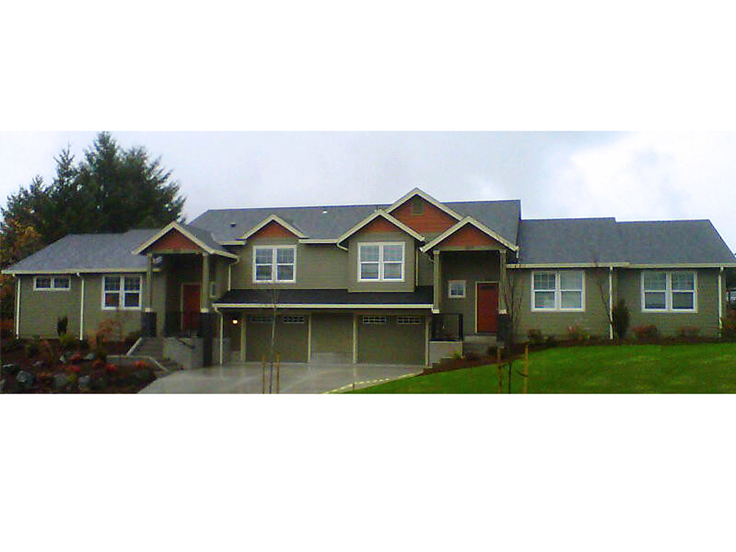 The House Plan Shop continuously adds new multi-family house plans to our website. 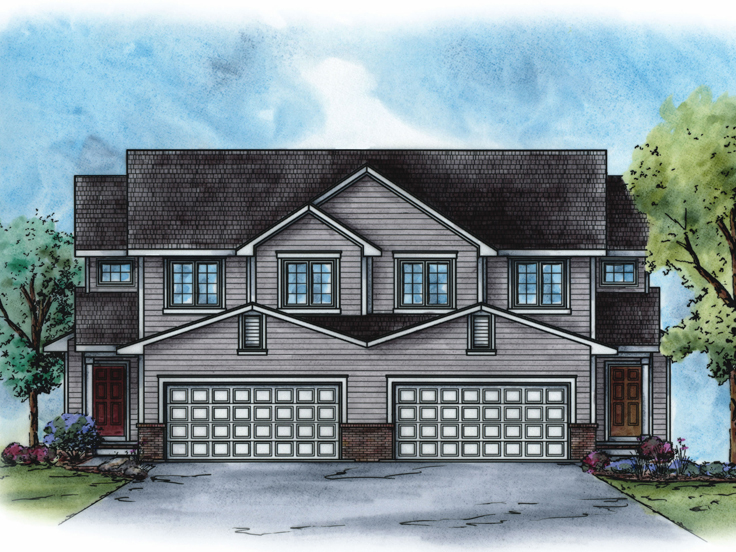 Take some time to learn about a few of our newest duplex plans. 031M-0082 – This duplex house plan is a very appealing house plan for two families. Park in the two-car garage and enter through the laundry room, which points the way to the kitchen in this open design. Enjoy chilly nights in front of the family room fireplace, then head upstairs to bed. Besides the master bedroom, there are two secondary bedrooms. Truly a floor plan to suit the needs of any family, times two. 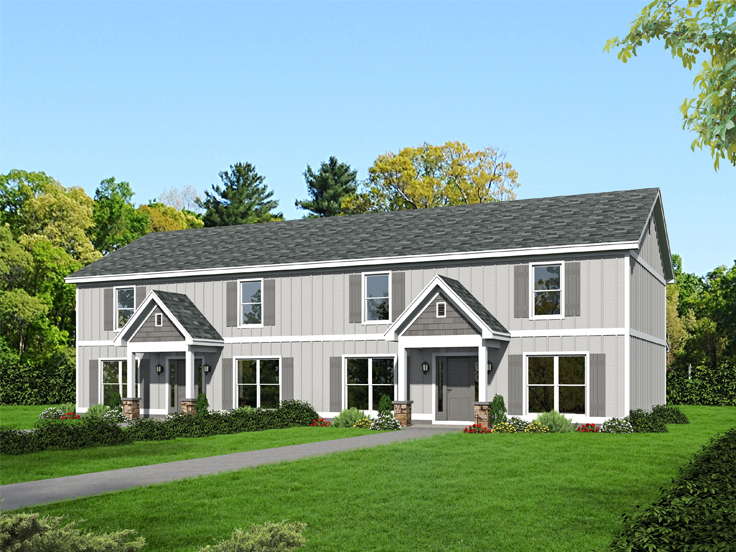 051M-0021 – This Craftsman plan presents two impressive units, each over 1400 square feet, and each with a front entry one-car garage. The open floor plan features a vaulted ceiling in the living and dining areas and in the master bedroom which is located on the main level. Well-spaced patios in back allow each family a bit of privacy when outdoors. Two sizeable secondary bedrooms upstairs share a full bath. A handsome exterior with definite curb appeal will draw tenants in, and the beautiful interior will make them stay. 062M-0002 – Here’s a multi-family plan that presents appealing attributes that will assure its occupancy. The main level offers a comfortable living room followed by the kitchen with a snack bar and dining area. Access the half bath from the living room and the laundry from the kitchen. All the bedrooms are located on the second floor. Equal in size, the bedrooms each have a full bath and a walk-in closet. This configuration will serve families with older children well and appeal to college students or any adults desiring to share living spaces with roommates. 051M-0024 – This duplex house plan is so attractive that one must look closely to realize that it is not a single residence. The kitchen features a snack bar in this open floor plan that can be used to pass dishes to the dining room. Upstairs the owners’ suite and two secondary bedrooms reside in peace and quiet. With the garages located at the back of the plan, each unit is privileged to possess a very private side patio.